A few years ago, when I was taking a playwriting course at the Berkeley Rep theatre, I came across Tony Kushner's adaptation of "A Dybbuk," a play by S. Ansky, translated from Yiddish by Joachim Neugroschel and collected in a volume by Theatre Communications Group with afterword by Harold Bloom and a few other Jewish folk tales and tales by Ansky. The collection traced the motif of the dybbuk--a malicious soul of the dead capable of taking possession of somebody still living--from 19th Century Eastern European Jewish folklore to Ansky's popular piece of Yiddish theatre. Shortly after I read the book, brothers Coen released A Serious Man where a dybbuk vignette prefaces the main narrative: one of the most memorable recent adaptations of the motif. Recently, reading up on the history of the Russian revolution, I came across Ansky's name. In brief: he was born Shloyme Rappoport in Belarus, a part of the Russian Empire. Though he received a traditional Jewish education in the yeshiva, as a seventeen-year old he broke with orthodox Judaism, learned Russian, and traveled around Jewish shtetls as a teacher providing secular knowledge. He became a passionate narodnik, trying to enlighten peasants (Jewish and Russian) to their own condition of serfdom and to incite social unrest at the "grass roots," as we put it today. He worked for several years in a coal mine near Dnepropetrovsk (today, a part of Ukraine), organizing readings among the miners and trying to convert them to the socialist cause. The miners were very mixed in their ethnic and religious origins: from Orthodox Russians, Ukrainians, and other to Lutheran Germans, Volga Muslims, Jews; all who failed to make a living on the surface. They gave Shloyme Rappoport a nickname: Semyon Akimovich. He then started sending stories of mining life to a prominent socialist newspaper, and one of the editors noticed his gift for storytelling and advised him to take instruction with Gleb Uspensky, a notable Russian writer of socialist leanings. Viktor Chernov, later a leader of the Socialist Revolutionary party, relates a story of how Rappoport arrived to St. Petersburg. He had no place to stay and no papers (Jews at the time had to have a special permission to be allowed in the capital). Instantly upon arrival he went to party headquarters and sat in on a meeting, and after the meeting everyone went home but Rappoport was shy to admit he had nowhere to go. He spent the night walking the streets, afraid to sit down for the fear of being picked up by the police. Towards morning, Uspensky, returning from an all night dinner party, found him roaming the streets. The older man was touched by Rappoport's story and took him under his wing. He gave him a few pointers about the literary world and helped him come up with his pseudonym--S. An-sky. Eventually, the socialist group sent An-sky to Paris, to work as a secretary to an older narodnik, Petr Lavrov. An-sky worked for him for six years, taking dictation of Lavrov's influential philosophical and political essays. Eventually An-sky started writing essays and fiction to explain the socialist ideas in the language that would appeal to peasants--that would inspire them and turn them to political action. That was a rare talent among the revolutionaries of the time, and An-sky quickly became an important figure in the socialist movement. After the failure of the revolution of 1905, An-sky little by little turned his attention to the Jewish cause and organized the first ethnographic expedition to Jewish shtetls, describing the effects of pogroms on the communities, and also witnessing the practices of everyday life, recording folk tales and legends, oral histories. During the revolution of 1917, An-sky was elected to the Constituent Assembly as a member of the Socialist Revolutionary party--the democratically elected legislative body that was later dissolved by the Bolsheviks (under Lenin's leadership). A fully bilingual author, An-sky seemed equally comfortable writing in Yiddish and Russian, though he rarely translated himself and didn't like doing so. There are several origin stories of "Dybbuk": he wrote the play in 1914, and at some point showed it (the Russian version) to Konstantin Stanislavsky at the Moscow Art Theatre who admired it and gave advise. The play received its premiere in 1920, after WWI and Bolshevik takeover--it was staged in Warsaw, in Yiddish by Vilna troupe--a few weeks after An-sky's death. 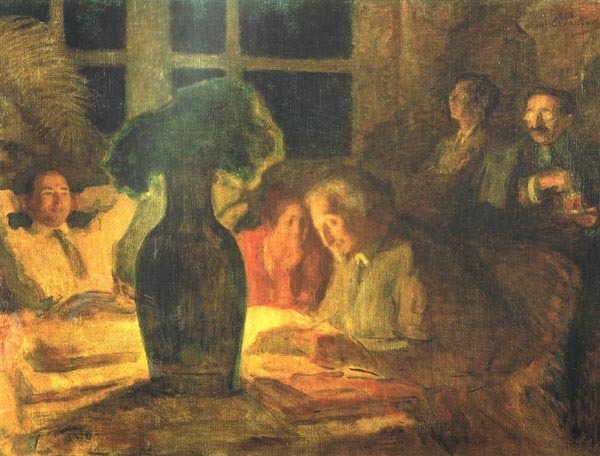 Leonid Pasternak's painting: S. An-sky reads "Dybbuk"